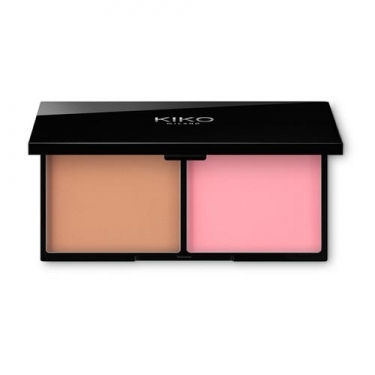 DESCRIPTION: Smart Blush&Bronzer Palette from KIKO is a palette with blush and tanning powder to intensify the skin tone and sculpt the volumes of the face. Both products can be used together or separately. Fine texture, easy to blur and modulable for a natural to intense effect. Practical and comfortable application, immediate color diffusion. Take a small amount of product with a face powder brush and apply on the cheeks and cheekbones, gaping from the outside to the inside of the face. Pick up the tanning powder with a brush and make circular motions. Apply the product by gently rubbing it on the face, neck and lap.